Tough, Zytel folding stock makes your lightweight T/C rifle into a remarkably compact unit that fits in a backpack or behind the seat of your truck. Solid steel, one-piece mount and locking hinge eliminate the "sloppy" fit and game-spooking rattles caused by flimsy, plastic parts. 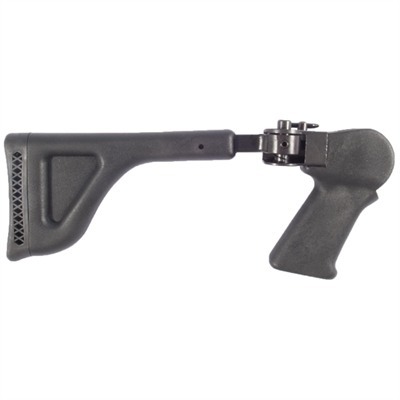 Contoured pistol grip helps you hold extra steady when shooting at long distances. Pivoting buttstock locks securely into the shooting position and folds out of the way by pushing down and swinging it to the right. Thick, 1", rubber pad takes the punishment out heavy recoil for more enjoyable shooting. Encore features a beefy, uncheckered, pistol grip to help counter muzzle rise on big bore gun Mfg: Choate SPECS: 4140 steel and Zytel, black. Encore - 1.9 lb. (.86 kg) wt. 13 1/2" (34 cm) LOP. Models for Thompson Center Contender and Encore.